There’s a big buzz around video marketing these days. And there are many different ways to grow your small business with video. 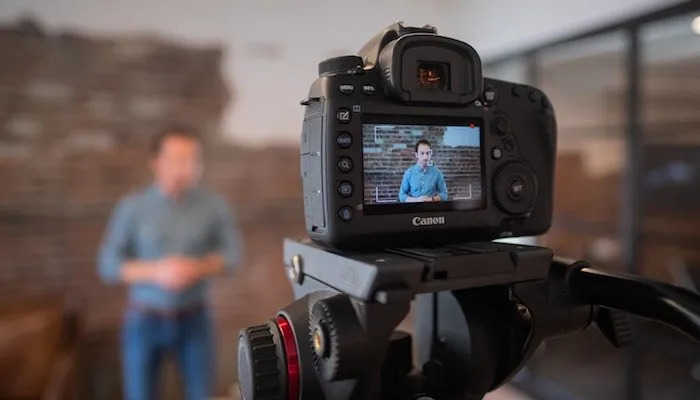 So let’s have a look at 4 common video types and how you can use them for your marketing. If you’ve never created videos before, the idea of a video marketing campaign might seem a bit scary. But there are lots of benefits for your small business. Have a look to see which option(s) might work best for you! Having a strong brand and USP is really important to help your small business stand out. Traditionally, it has been established through things like your logo and your web copy. But lately, I’ve seen many companies using a brand identity video. And it’s a great way to grow your small business with video, too. They combine visual and audio elements and can showcase all aspects of your brand identity. So make use of your brand identity film to show your values, introduce your team and explain what your company stands for. Videos like this can be used for lots of marketing activities. For example on your social media channels, in your email newsletter or at events. To create a really strong and memorable brand video it’s probably worth investing in professional help. Read more about how to define your small business’s brand. Another way to grow your small business with video is an event trailer. Organising an event for your small business? Then a video can help you get people interested in the event. Videos like this work well for everything from a new product launch party to a week-long business conference. No matter what type of event you’re holding though, a video trailer allows people to get a taste of what to expect from the event. This helps to build excitement and really gets people engaged in what you’re doing. As it’s a trailer, you want to make sure the video doesn’t give too much away! Think of it as a teaser for your event, highlighting some of the key features and hinting at what to expect. But leaving enough to the imagination to make people want to buy a ticket and come along to the event itself. If you find you often get asked how your products should be used, why not create product explainer videos? It’s another way to grow your small business with video. These kind of videos should be factual, but still entertaining. They should give people some creative inspiration to help make the most of your products. If your product is quite technical, you might want to create instructional videos. For example, a camera manufacturer might create a series of videos showing how to use the features on the camera. Alternatively, someone who creates flavoured chocolate bars might create some recipe videos showing how to bake something delicious with the chocolate. Product explainer videos are easy to create yourself. Just make sure the video is clear and high quality. Try to keep them quite short and snappy so viewers don’t lose interest. But make sure to include all the key details they need to know. Another use for product explainer videos are your FAQs on your website. Or you can use them on your social media channels. Videos are a great tool for your website, newsletter and even offline marketing. But the place they’re most commonly used is social media. All the types of videos I’ve talked about so far work really well on Facebook or LinkedIn. But you should think about creating videos specifically tailored to each platform. To grow your small business with video, use them to engage your followers on social media. Stats show that, on average, videos on Facebook get around 7 times more engagement than other post types. So it’s really worth investing some time and effort to create interesting video content for your followers. Social media videos don’t need to be professionally produced. In fact, often it’s casual videos recorded on your phone which tend to perform best! Keep them short and interesting – not many people are going to sit and watch a 10 minute video when they’re scrolling through their Twitter feed! For example, you could do a “meet the team” video, show behind the scenes at your office, share a video from an event you’ve been to or introduce a new product… the possibilities are endless! Live Videos – available on Facebook, Instagram and Twitter, they’re particularly popular on Facebook. This is a great opportunity to interact directly with your followers, so it works really well for Q&As, interviews or coverage of live events. Stories – these are very popular on Instagram at the moment, and are also available on Facebook. You can share short videos (and photos), which will disappear after 24 hours. These are great for behind the scenes snippets, sharing announcements or asking your followers questions. Previous Article Previous Article: What Does Success Mean to You and Your Small Business?